In numerology, 2017 is year one (2+0+1+7=10, which breaks down further to the single digit of 1). A universal “1” year represents the start of a fresh new cycle. 2017 bids us all to start something brand new, something that expresses our uniqueness and opens us up to new perspectives. This year feels different from all the others since it is a new beginning. This is a fresh start; things are falling by the wayside that do not service us anymore. To me, being that this is spring, launching a new scent now in year one is new. It’s a new beginning; a rebirth, refresh and restart. While creating the scent, the name “Ahnu” found us, which was a sign that it’s meant to be. The name Ahnu (pronounced “ah-new”) is derived from the Celtic goddess of well-being and balance, Anu. All of the names of Ambre Blends Essences (Ambre, Invoke, Solace, Unmasque and now Ahnu) have something to do with what is going on in my life when I create it. This one is perfect because it’s for everybody, it is universal. You might notice that on the label of Ahnu Essence is a lotus flower. This is a symbol of purity, devotion, enlightenment, grace and rebirth. A lotus flower grows out of muck; through all the sludge and slime, this beautiful, brilliant, pure blossom grows and emerges. I look at this as a metaphor of life as we know it. We can make the best of our crummy environment and rise above it! The violet label was also intentional, for it is the color of spirituality. Violet has the highest vibration on the visible spectrum. It is a color of enlightenment and imagination, getting us in touch with our deeper thoughts. Violet inspires unconditional and selfless love, it is devoid of ego and encourages sensitivity and passion. Violet expands our awareness, connecting us to a higher consciousness. 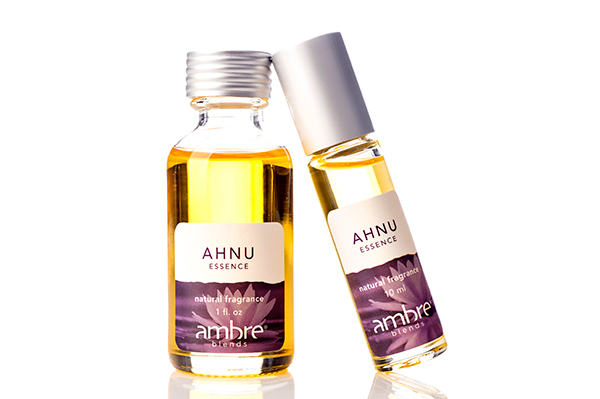 The emergence of Ahnu Essence represents a return to the clean earthly roots of Ambre. Ahnu is a balanced and transcendent aroma mixing the sweet, tenacious scents of tuberose and lotus flower with the warm soft notes of violet leaf, tobacco and champaca. Ahnu Essence is a fresh and suave natural fragrance which will simultaneously ground and enlighten you. I like to describe the scent of Ahnu as an earthly rain. When it rains, the earth has cleansed itself. Ahnu is reminiscent of the fresh, earthly smell that happens when you walk outside on a spring day and it just rained. When a raindrop hits the earth and interacts with dirt, it comes back up into the air and releases what scientists call aerosols, which are what cause that fresh and almost sweet fragrance that you smell. Tuberose: This clean and sweet scent opens your crown chakra, which is responsible for creative powers and peace of mind. Tuberose has aphrodisiac and tranquil properties, which will enhance what is already happening with the Ambre Essence. Violet Leaf: This soft, leafy green is used for overcoming fears and shyness. It is an oil of springtime and new beginnings. Tobacco: Pure tobacco is warm and earthy. We used strictly for the smell and to put a masculine touch on the scent (remember, all of our scents are unisex). Lotus Flower: This sweet, earthy and tenacious oil is used for meditative and devotional practices. It is medicine for the soul! Champaca: Champaca is rich, velvety, sensual and suave. It brings relaxing, euphoric effects. Used in aruvedic practices, it evokes unconditional and universal love. Champaca helps you tune in to the vibration of divine love and beauty. I am extremely excited about the launch of our fifth scent for both what it means and how it smells. The last time we launched a new scent was on April 21, 2011, and now Ambre Blends has grown to be much bigger than it was back then. As much as I have been feeling the pressure for this launch, the excitement is on a whole new level for us. I’ve been looking forward to creating a new scent for quite some time, and I feel like this is it. I truly believe that we hit the nail on the head with how Ahnu smells, and I can’t wait to share it with everyone! We’re all yearning for a new beginning, and we’re all starting fresh together. I hope you enjoy Ahnu as much as we do!